Contact your power company if possible to make them aware of the outage in your area. Do NOT call 911 about the power outage unless you have an emergency. The 911 dispatchers may be busy with emergencies that led to the power outage and are unable to contact your power company for you. For more information on the 911 system in our county click here. Have an emergency kit available that includes an alternative cell phone charger, water (one gallon per person, per day), plenty of shelf stable/non-perishable food, a manual can opener, flashlights, cash, a NOAA weather radio, extra batteries, and a warm blanket for each person. Create an emergency communication plan to be ready to contact loved ones. Keep your vehicle’s gas tank at least half full since gas stations may also be affected by the power outage and may be unavailable. Get battery back-up or a generator for medical or assistive devices that require power. If your power goes out during the winter, have a plan to keep warm. If you have a woodstove, or other non-power required heat source, use it safely and be sure to maintain your chimney throughout the year. Listen to local radio stations for shelter locations if you are unable to keep warm in your home. Use candles as lighting. Keep plenty of flashlights and batteries in easy to find places throughout your home. Many house fires are caused by mishaps with candles. Make sure smoke and CO detectors are working. Use your oven as a source of heat. Fires and serious burns can occur – especially in young children and pets who may be curious about the oven door being open. Run a generator or other fuel burning device indoors. This can quickly lead to carbon monoxide poisoning and even death. Keep generators at least 20 feet from the house and don’t use grills, camp stoves or other devices in the house, basement or garage. Conserve your cell phone battery – only use it for emergencies. Put on warm layers of clothing. Check on your neighbors – especially those that may be elderly or have specific needs. Can’t find the information you needed here? Call us at 518-719-3600 and we’d be happy to provide more information. Be sure to follow us on social media for important updates on power outages and tips that you can do throughout the year to prepare your home for a blackout. While blankets of fresh snow and glistening icicles in the trees may certainly be beautiful – the winter season can present us with some pretty big challenges. From shoveling snow to navigating icy roadways, your body is working harder in the winter to stay warm, healthy and safe. Snow shoveling may not be safe for everyone. If you have a history of heart disease, other chronic ailments, or simply haven’t been active for a while, talk to your doctor first about how to prepare to keep your driveway and walkways clean. Hypothermia usually occurs when your body loses heat faster than it can be produced and is usually experienced at very cold temperatures – but can occur even at cool to mild temperatures if someone becomes chilled from wet/damp clothing, sweat or being submerged in cold water. Initially, your body will respond by shivering which is one way your body can produce heat. Call 911 or seek immediate medical attention if you have signs of severe frostbite or hypothermia. Learn more about the signs, symptoms and how to treat hypothermia here. Check the weather often to be sure you are aware of any incoming storms or weather conditions. Heavy snow and ice can easily cause downed trees and power outages. (link to power outages page). Have an alternate heating source and fuel available and be sure to maintain your primary heating source throughout the year. Improperly maintained heating systems and generators can lead to CO poisoning and even death. Learn the signs and symptoms and prevention of CO poisoning here and here. Need to be on the road during the winter? Always make sure you keep the gas tank and windshield wash in your vehicle full during the winter. Use a wintertime formula for the windshield wash to avoid freezing. Make sure your tires have adequate tread; or that you have replaced your tires recently with all-weather or snow tires. Be aware of your surroundings – it can be easy to become disoriented in a winter storm. Driving during the winter requires using different techniques. Make sure you slow down during the winter – even on a nice day, ice may still be present on the roadway. Make sure you leave plenty of room between you and the vehicle in front of you – especially snowplows and other large vehicles. Summertime isn’t just about the heat – it can bring with it a plethora of storms and environmental conditions that can threaten your health. Thunderstorms, heat waves, tornadoes and power outages can all interrupt your regularly scheduled summer activities but with a little information and a lot of prevention, you can avoid a disaster affecting you. Be aware of upcoming storms by checking the weather often. Learn to deal with power outages here. Everyone looks forward to summer for the time off, fun in the sun and endless outdoor possibilities. While summer has its perks, there are steps you can take to safeguard your health and safety when the temperature begins to rise. Engaging in too much physical activity on a hot day, simply spending too much time in the sun, or remaining in an overheated place for too long can all lead to heat-related illnesses. Heat-related illnesses occur when the body can no longer compensate for the temperature to keep cool. Normally, sweating is how your body cools down, but sometimes this isn’t enough and your body temperature can continue to rise which could damage your brain and other vital organs. Humidity and personal factors such as age, weight, hydration level and chronic conditions can all affect how your body deals with the heat. Heat-related illnesses and deaths are responsible for an increasing amount of deaths and hospitalizations every year – even though it is preventable. Think you can’t get sick from the heat? Think again. Anyone can suffer from a heat-related illness, but those at greater risk are people aged 65 and older, infants and young children, and those with chronic health concerns – especially heart disease or high blood pressure. Limit your time in the heat – try to stay indoors or an air conditioned area as much as possible. Don’t have air conditioning at home? Visit a shopping mall, library or coffee shop for a little while. Drink plenty of fluids regardless of your activity level – don’t wait until you’re thirsty to drink, this may be a sign that you are already dehydrated. Avoid caffeine, sugary beverages and alcohol which can actually dehydrate you. NEVER leave infants, children or pets in a vehicle. Even with the windows cracked, interior temperatures can rise almost 20 degrees in the first 10 minutes! Don’t forget your animals! Heat stress can also affect our furry friends – make sure they have access to plenty of water and even consider adding ice to their water source. If possible, bring them inside. Ever heard the saying “when thunder roars, stay indoors?” While it may be tempting to watch lightening jump from place to place, thunderstorms present real danger and are responsible for a number of injuries and deaths annually. If you are caught outside when you begin to hear thunder or see lightening, find a safe, enclosed shelter such as your home, office, shopping center or a vehicle to wait out the storm. Avoid taking baths, showers, or having other contact with water during a thunderstorm. Just like water, avoid using electronic equipment and corded phones and have surge protectors on all of your electronics to protect them. Stay away from windows, doors, porches and concrete structures. Did you know that lightening can travel through a building’s plumbing, electrical wires and even the metal wires/bars used to make concrete walls and flooring? Avoid staying in open spaces or vehicles such as motorcycles, convertibles and golf carts. This can make you a more presentable target for a lightning strike. Likewise, avoid being near tall structures which are also common targets of lightning strikes. While stuck outside, crouch – don’t lie down! If possible, crouch down into a ball like position with only your feet touching the ground with your head tucked and hands over your ears. Lightening can travel over the surface of the ground – if you lay down, you are raising your chances of being affected by it. Severe thunderstorms can bring high winds and hail with it which can cause damage to property and injuries to people who are out in the storm or improperly sheltered. Stay away from windows – move to an interior room in your home or workplace to avoid being injured by window glass shattered by hail or other debris. For more information on lightning and safety tips, click here. While not as common as in other parts of the country, tornadoes have happened in New York and even in Greene County in the past. Did you know that most injuries occur during the disaster when people are injured by flying debris, and after the disaster by the wreckage left behind? Preparing for this rare occurrence and knowing what to do can help keep you safe and healthy. Stay aware of upcoming storm systems by watching or listening to the local weather and paying attention to watches and warnings. Keep a weather radio with you and fresh batteries – strong storm systems typically disrupt power and cause outages at the time you need to be listening to the weather the most. Be prepared to take shelter immediately! Never stay in a vehicle or mobile home during a tornado – they can overturn quickly during strong winds. If there is no other building available nearby, lie flat in the nearest ditch, ravine, or culvert and shield your head with your hands. Make a plan with your family on where you will go in your home if a tornado or another strong storm affects our area. Ideally, you should take your family to the interior portion of the basement in your home – that is the safest place. Don’t have a basement? The next best place is the interior most portion of your home on the lowest floor – usually a hallway or other small area without windows. AVOID WINDOWS! Glass from windows can injure and even kill. Want to know more about tornados? Find out here. Flooding has occurred in Greene County in nearly every season – from spring snow melts, winter ice jams, summer rainfall and autumn hurricanes. During the summer and fall months, Greene County is at risk from hurricanes and tropical storms which can bring high winds, flooding and strong thunderstorms. While we are lucky to have an abundance of water in our area and rarely experience severe drought conditions, we are more likely to experience flooding events. When the water starts to rise, we can help you prepare yourself and family to navigate through safely and maintain your good health after the storm has passed. Have plan with your family about where you will meet if you are not all together when the storm comes. How will you contact each other? Is your home in a flood-prone area or do you regularly experience water in your basement? Do you have a sump-pump or know how to turn off your utilities? Is your emergency kit stocked and available in an area where you can quickly access it without having to enter standing or moving water? Do you have a plan for your pets? If you have time, consider moving electronics such as televisions, computers and smaller appliances to the upper levels of your home that are less likely to be affected by floodwaters. Keep important documents with you – you may need them when you evacuate. Just like other natural disasters, flooding can occur quickly and sometimes with little warning. Creeks and rivers may rise, roadways can become covered and your basement may begin to fill soon after the storm begins. Never drive or walk on flooded roadways – it can be difficult to judge how deep the water is and the roadway may have been washed out or weakened by the water which you may not realize until it is too late. Vehicles can hydroplane and lose control in just a tiny amount of water or be carried away by deeper water – even if it is slow moving. Pay attention to evacuation orders and never ignore them. Many people have been left helpless and rescue crews are often unable to immediately assist those who have not heeded the need to evacuate. Be ready – have a bag packed of the things you will need to take with you so that you are not delayed in leaving. Consider keeping pets in carriers or on a leash during the storm so that you can quickly take them with you should you need to evacuate. Make sure you have food, water, identification and vet records for them as well. If strong winds and/or thunderstorm activity is present, stay away from windows and open spaces. Move yourself and your family to an interior room in the home to reduce the likelihood of being hit by glass or other debris. For more information on thunderstorm safety, click here. Once the storm has passed and it has been deemed safe to do so – you may wish to return home and check for any damage or venture out to check on your loved ones. Listen to the radio for road closures, alternate routes and areas still underwater where it will not be safe to travel. Use your plan to get in touch with family members and loved ones. Did you know that cell towers and phone lines can quickly become overwhelmed or jammed after disasters by everyone attempting to make calls at once? Try a text message instead – your text message will likely go through when a phone call will not. Texting instead of calling will also free up the phone lines for emergency calls. Just like you did during the storm, pay attention to roadways, closure signs and other hazards such as debris. Look for downed power lines and never approach them. Listen to the radio for information about affected areas. Basements and other low lying areas can quickly fill with debris and other items carried away by the water. Do not allow children to handle debris and be sure to protect yourself prior to any cleanup. Know when your last tetanus shot was. For information on reentering your flooding home and safety during cleanup, click here. Do not wade through or let children play in floodwaters. Not only is there a risk of drowning, but the floodwater itself is likely contaminated by septic and sewage systems, fuel, bacteria and other hazards that can make you and your family ill. Be certain to sanitize all surfaces and objects – including children’s toys, which may have been touched by floodwaters. Harmful molds can grow very quickly after floodwaters have receded. For information on flood clean-up after a disaster, check here. If you return home to find your basement flooded and you didn’t have a chance to shut off your utilities, do NOT enter the basement. There is the possibility of an electrical shock if the panel box or any electrical wires are touching the water. Natural gas and other fuel products can still ignite even in the presence of water. Your basement may also be contaminated if your fuel or oil tank became compromised. Contact your utility companies immediately. Be mindful of the safety of your drinking water – check for boil water advisories and consider testing your well. Ingesting contaminated water can cause make you extremely ill with symptoms such as diarrhea, vomiting, abdominal cramps, and headaches or worse. Before using water to prepare food, drink or even personal hygiene, make sure it is safe. Find more information about how to make your water safe here. Floods are not only destructive but costly as well. Even small amounts of water can add up to large losses. Use the following estimator to see how different water levels can affect your home. Here in Greene County, our emergency management structure and responders have learned a lot about flooding and how it affects our residents. We’ve been taking steps to ensure your safety. Learn about hazard mitigation in Greene County by visiting the emergency services page. Here in Greene County, we are lucky to have not only an abundance of water sources, but an abundance of annual precipitation amounts as well. We are often spared of the scarce water issues affecting other areas of the country. However, as we have seen with other disasters, we are not immune. Droughts can occur in New York when we don’t experience enough rainfall during the summer months – or even snowfall during the winter months which contribute to the water table during the spring time melt. Industries such as agriculture, recreation and others in our area all depend on a stable amount of water in order to meet their needs to supply resources and contribute to the economy. Individuals rely upon their wells and municipal water supply for hygiene, hydration and other day to day activities. In our area, the Department of Environmental Conservation (DEC) and United States Geological Survey (USGS) evaluate drought conditions and measure stream discharge, water levels, precipitation amounts and water-quality. There are four drought stages which are outlined in New York’s drought plan which includes steps that can be taken during each stage to reduce the effect of the shortage and can be viewed here. While we can’t control how much rainfall or snow we get each year, we can control how much water we use. Simple things like shutting the faucet off while brushing teeth, shaving, or washing dishes can save hundreds of gallons of water each month, saving you money if you use municipal water supplies. Fix leaking and dripping faucets, fixtures, pipes and running toilets which can save over fifty gallons of water per month according to the USGS. Consider installing water-saving fixtures like low-flow shower heads and toilets. Has there been a drought that is affecting your water? Be sure to click here. Little thought about in our area until last year, forest fires and wildfires are a serious issue that can have large impacts on our health, the environment, wildlife and our properties. Each spring, Greene County assists New York State in enforcing the annual burn ban which occurs on dates from March through May. During this time, when most wildfires in New York occur, there is no open burning of any kind except in the following cases. This is to reduce the likelihood of small fire turning into a big problem. Did you know that wildfires can increase the risk of flood for years after the fire? This is because the charred ground and lack of vegetation cannot absorb the water as well as it once did. Learn more here. In 2015, New York State experienced 110 wildfires which destroyed or damaged nearly 3,600 acres of land. Over 100 of these acres burned here in Greene County. 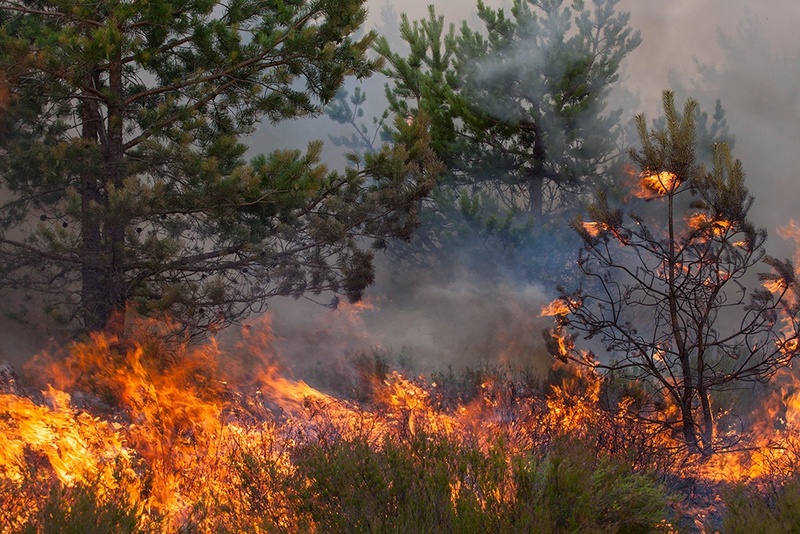 Carelessly thrown cigarettes, unattended burn piles, poorly stored agricultural materials and other sources of ignition all contribute to wildfires which not only destroy properties, but adds harmful pollutants into the air we breathe. Smoke from burning grasslands and forests can produce toxic gases containing formaldehyde and fine particles that can irritate the eyes, nose, throat and lungs leading to health problems both short and long term. To learn more about the health effects of smoke and fine particles click here. Be mindful of your surroundings. Watch for smoke and/or flames rising up from places it normally wouldn’t be (no nearby chimneys, homes, etc.). Call 911 immediately and be sure to tell the dispatcher exactly where you are and what you see. When camping or engaging in other outdoor activities, never leave a fire unattended and be sure you have enough water within reach to properly extinguish it. NEVER fall asleep with a burning or smoldering fire nearby. Educate children about fire safety. Protect your home and property by keeping gutters and rooftops clean of dry leaves and other debris. Be mindful when landscaping. Create a space around your home approximately 30 feet in diameter that is free of anything that will burn including wood piles, brush, trees, and dry leaves. Keeping large and small trees back from your home will also protect it from falling limbs and other debris during seasonal storms. Know various routes to and from your home and evacuation areas – just like water, fire can quickly take over roadways and you should never attempt to drive through it. Have a plan with your family about what will happen if you are not together when you need to evacuate – where will you meet, how will you get into contact with each other? Keep the gas tank on your vehicle at least half full and able to travel at a moment’s notice. Have your emergency kit stocked and within reach. Want to learn more about preparing for wildfires? Click here.